I am always looking for cooking shortcuts. My hungry boys eat 6 times a day so if I don’t cut some corners I will never leave the kitchen. My latest creation is the “Arabic Pizza” for those days when I am really in a time crunch. I get some Arabic bread, and quickly warm it on the skillet. I then add some ketchup and oregano and grate some cheddar or feta on top and blitz it for a few seconds in the microwave. The finishing touch is to cut it into pizza slices using the pizza cutter so it looks more “real”. But I knew I had gone too far when we went out for pizza and my kids actually preferred mine! I was shattered that I had ruined their developing taste buds. At this rate we will never enjoy a true NYC slice together and I absolutely cannot have that. So, I decided to make something more interesting, more spicy, and to incorporate vegetables. 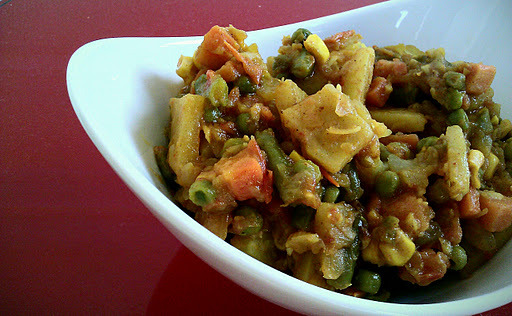 I came up with this mixed vegetable sabzi that uses ingredients I always have on hand and I can make in a flash. (Although not as fast as the Arabic Pizza!). 1. Heat oil in pot. Add onion and cook until softened. Keep on medium high heat. 2. Add in ginger and garlic and sauté for a couple minutes. 3. Add potato and sauté for a few minutes. Add the vegetables and the tomatoes and green chili and sauté. Add salt and all spices and mix. 4. Cover and put on medium heat. Cook for 15 minutes or until all veggies cooked and flavours incorporated. Season to taste. Garnish with fresh coriander if preferred. This entry was posted in Indian/Pakistani Recipes, Main Course, Vegetarian and tagged indian food, mixed vegetable sabzi, Vegetarian by thepantrydiva. Bookmark the permalink.